Washington insider John Buckley makes an extraordinary fiction debut with a comic novel about a world he knows better than anyone else. Family Politics tells the story of a patrician Hatfields-and-McCoys feud fought on the campaign trail and in the pages of the tabloids as two members from different wings of an infamous dynasty become rival candidates in a New York senatorial campaign. The novel is both a devastating satire of modern politics in all its absurd glory and a hilarious portrait of family rivalries and celebrity-making, American style. Here are the campaign misadventures of the once-celebrated, now ridiculed Daley clan, a dynasty that has been battered a few too many times by the press, the unions, and bloodthirsty ex-spouses. Charles Daley has always tried to keep his distance from his eccentric bunch of relatives – inventors, mystics, womanizing race-car drivers – whose brushes with greatness, from Picasso to Cronkite to Menudo, are as commonplace as tabloid headlines. But when Charles’ brother, a dogmatic supply-sider, challenges their uncle, liberal Republican Senator Nate Stanton, the allure of the simultaneous vicious campaign and family feud is too great. Taking charge, Charles marshals the bleary-eyed, battle-scarred forces – aunts, uncles, dozens of cousins and hangers-on – to wage battle, hoping for some luck, a bit of the old Daley magic, and a thirty-second spot that smears Uncle Nate just right. With old-fashioned mudslinging and state-of-the-art media consulting, the battle heats up into a riotous down-to-the-wire climax where all the rules are abandoned and politics – and families – revert to their most primal nature. 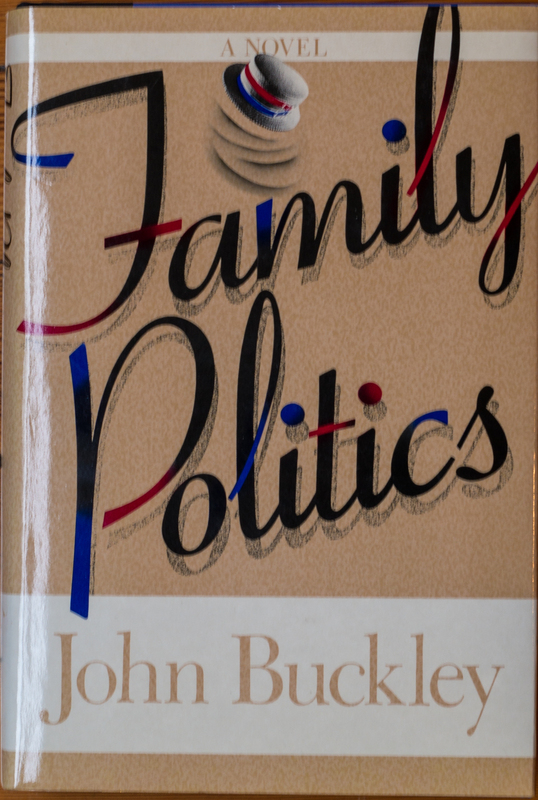 “’Family Politics tells the stort of a big, rich, talented, celebrated, privileged, Roman Catholic, eccentric, debauched, self-obsessed and devoutly political family that turns on itself when Edward Daley, a right-wing Wall Street Wunderkind and disabled Vietnman War veteran (his own men shot off his arm) decides to challenge his maternal uncle, New York Senator Nate Stanton, in the Republican primary. “The book’s narrator, Charles Daley, is a punk-rock critic for The Downtown News (Mr. Buckley was punk-rock critic for for the now defunct Soho News) until he signs on to run his big brother’s campaign. “Though the book is a melange rather than a roman a clef, political insiders will delight in finding the references that are hidden throughout, like Ninas in a Hirschfeld cartoon.